Have you ever gone to a party and been confronted with a dish that makes you question the creator’s sanity? I have; it was just last year and the the food item I found so strange was chocolate covered liquorice. Granted, I am kind of a food purist when it comes to chocolate, I mean, chocolate is at the tippy top of my Foods I Love list. Not chocolate covered strawberries, chocolate covered nuts, or chocolate dipped bacon (Ew. What is the matter with people? No, just stop it with the bacon and chocolate.). I want just plain chocolate, a brick about the size of my head would be nice. The incorrectly quoted Gestalt principal that the whole is greater than the sum of its parts does not apply to chocolate covered confections*. Chocolate on its own is the greatest and adding anything to it does not make it any better. I only have two exceptions to this rule of mine: chocolate covered salted caramels (excuse me while I go get a towel to wipe the drool off my keyboard), and as of last year, chocolate covered liquorice. I’m not going to lie, when I first looked at the chocolate covered liquorice on last year’s Christmas table I thought What the…? Who made this abomination? Then I turned and asked the hostess if she had been drinking when she came up with this. She’s my sister-in-law and she knows I love her, so it was totally okay that I insinuated she had been drunk cooking. Anyway, I passed over this dish a few times but ultimately felt sorry that these liquorice morsels were not getting any love and reluctantly put one one my plate. Two hours and ten pounds later I found myself elbowing my daughter out of the way so I could get to the last one. In my defence, she should know better than to get between me and the sweets table – it isn’t safe. 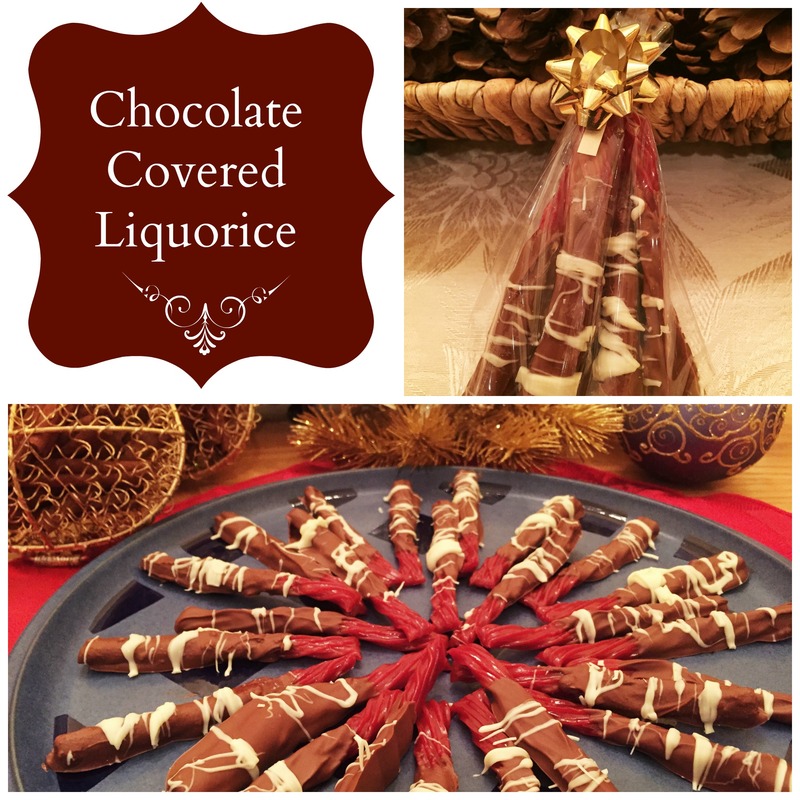 Now, chocolate covered liquorice is on my Must Make list at Christmas. I love giving gifts from my kitchen and these will be a nice addition to my ginger crinkle cookies and fudge. The only problem I see arising is not eating them all before I get them packaged up and out the door. It will take every bit of my gift giving spirit to exercise some self control and share my festive bounty. On the other hand, I am a firm believer in the To: Me, From: Me gift, and I see nothing wrong with all of us whipping up a batch to go under our own trees. *Yes, I know I used the incorrect version of the quote, but it suited my needs and it’s Christmas, so I’m hoping you’ll be merry and at peace with it. Cut 15 Twizzler liquorice sticks in half. Cover a cookie sheet or rack with parchment paper of aluminum foil. In a double boiler heat the milk chocolate chips over low heat. Do not increase the heatto make the chocolate melt faster. Overheated chocolate can become thick and muddy. Once the milk chocolate is melted and glossy, dip the liquorice into it leaving a few inches without chocolate. Place chocolate coated liquorice on the lined cookie sheet/rack. Once all the liquorice sticks are coated with milk chocolate, melt the white chocolate in the cleaned double boiler. Use a spoon to drizzle the white chocolate over the milk chocolate portion of the liquorice sticks. Make sure no water, not even little drips from your stirring spoon get into the melted chocolate. This will cause it to sieze. We first tried chocolate covered liquorice at Avonlea Village in Cavendish, PEI a few summers ago and oh my goodness it is so good! The Anne’s Chocolates brand uses the old fashioned soft red or black liquorice. We loved the cherry red! I love the idea of using a Twizzler! Love! Trying this with the Things! Definitely! I know, right?! It is so good. In theory is does not sound very appealing, but the actual taste is divine. I’ll have to try black liquorice. I only use strawberry. Yum! Looks good, Kelly! I might have to give this a try… Twizzlers are one of the few commercial candies that are safe for my kidlet 😀 I can’t use the white or milk chocolate chips but Camino’s got allergy-friendly semi-sweet.